In Furious 7, Jason Stratham plays Shaw, a black ops, covert super spy who is out for revenge after Dom’s (played by Vin Diesel) crew put his little brother in the hospital on their last Fast & Furious romp through the country of England. Shaw is hell bent on killing the entire team. He proves it by beginning with Han (Sung Kang) in Tokyo, and making plans to knock off the rest of Dom’s family one by one. The movie starts off with a bang — literally — as Shaw delivers a package to Dom’s front porch in L.A. with a bomb that blows up his home and endangers everyone he cares about. So, Diesel and the entire crew saddle up to settle the score with the bad guy. That’s about the entire plot you need to know. The rest of the movie is filled with car chases, explosions and action stunts that are out of this world. The movie will leave you breathless and on the edge of your seat. The stunts in Furious 7 easily out rank anything you’ve seen in any previous Fast & Furious movie. There is also the sentimental theme of the movie that we are all aware of before the movie begins: The tragic passing of Paul Walker. Furious 7 has a few tender moments that tear at your heart when you think about the fact that the actor died in a tragic car crash in real life. There are also some bonus scenes of Walker at the end of the movie (so, don’t get up and leave too early). 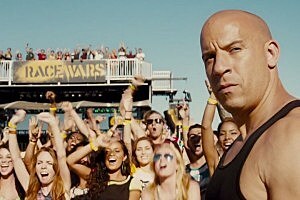 Furious 7 is also shot in some exotic locations, like Abu Dhabi and Japan, and features lots of exotic fast cars, some smoking hot beautiful women and, of course, the testosterone-fueled cast is all back, also including Dwayne “The Rock” Johnson, Tyrese Gibson and Chris “Ludacris” Bridges. The movie is rated PG-13 for scenes of intense violence, mayhem, and strong language. It is a non-stop, action packed thriller that keeps your attention for the entire 137 minutes of the film. Furious 7 is a fitting final tribute to a beloved actor and it’ll make even the strongest man in the audience shed a tear or two to his memory. On my Hollywood popcorn scale, Furious 7 is a jumbo.